Every week I share a Colour Palette created from images discovered on Pinterest or Royalty Free images manipulated in Photoshop. Subscribe (via RSS or email) to see new palettes every week. 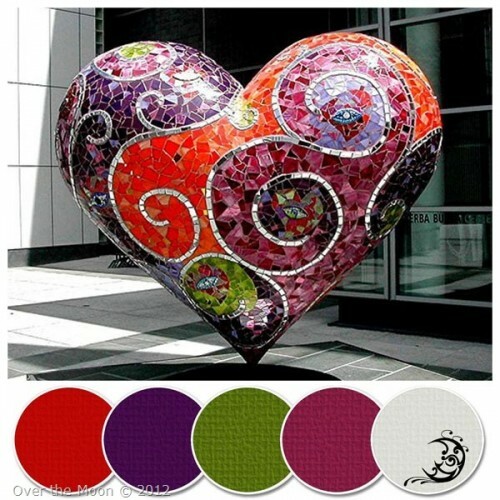 A few weeks ago I was surfing through Pinterest, looking for some interesting pictures to turn into colour palettes, and I saw this image of a mosaic heart. Apparently this heart sculpture is by Lauren True and is part of a collection of heart sculptures in San Francisco. I love this heart!! I’d love to have a pendant or bead like this with bright colours and swirls. Hubby and I don’t really celebrate Valentines Day, we don’t even take note of our wedding anniversary. It was quite funny really when my MIL dropped by in November with a gift for our 20th Wedding Anniversary. I’d completely forgotten about it, Hubby had mentioned it the week before and suggested a date night but we never quite got there. My birthday is the same, after all it’s just another day of the week, and I can never remember just how old I am (after stopping to think I’m 44) it’s only a number after all. So, what about you? Do you celebrate Valentines Day? If you do, what did you do (or will you do) to celebrate the day?